Perfect your Catalyst System with the Catalyst Tank Cover. 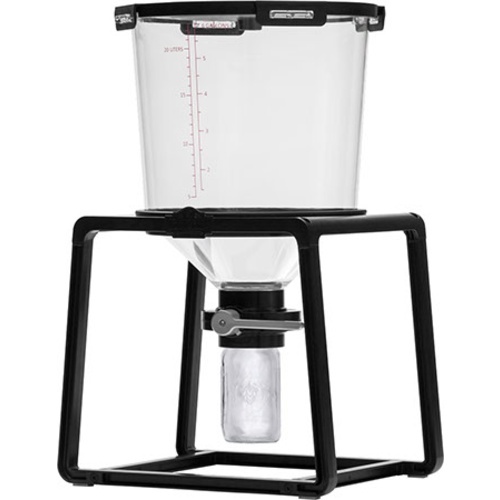 Looking for a better way to ferment my beer. Eric Palmer told me to. He is the beer Yoda. I was told plans were in the works to add a stainless coil (similar to item FE863) for pumping glycol in order to use this item independent of a temp controlled fridge. Is this still in the works? BEST ANSWER: Hi Jacob - We have not heard anything about that, apologies. What is the dimensions of the base? I would like to see if it'll fit in my fermentation chamber. BEST ANSWER: Hi Charles - The stand width is 17". What is the height, with the airlock? BEST ANSWER: Height of the unit is 26.25". Assume an airlock will add 3-4" to this. 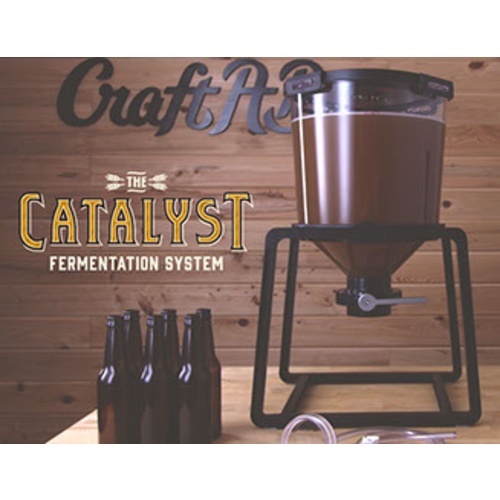 Catalyst Fermenter System a hit! Have been using it since the day it arrived around a year ago. Have rep itched yeast for the first time in 15 years of home brewing thanks to this system. No complaints on my end. Easy to set up, easier to clean, love it! Makes the whole process easier! Definitely recommend this product! This is one of the best things I could have done to streamline my fermenting & bottling. Sturdy construction but light weight. Air tight seal with a removable (and washable) rubber gasket. Love being able to remove the trub and yeast! I let the wort settle for 45 minutes after transfer before pitching, and then remove a full mason jar of trub. My beer has improved in appearance and taste. I've also been capturing a large quantity of healthy yeast saving me money for the next batch. 1 minor quibble - wish it used a #10 bung which I could then drill for a thermowell, or if they included a thermowell, and sample port. Not good for bottling from without re-racking especially if you dry hop. Concerned about the lid fasteners, as they are attached only by the plastic. Don't know how long they will last with the bending to lock and unlock the lid. Lid gasket is a pain to get back on if it comes off. Next time I may use a few drops of glue to put back on. Small leak when first loaded up with sanitizer but tightened up nicely. Larger size was not available when I ordered this one and that’s the one I would recommend over this one. 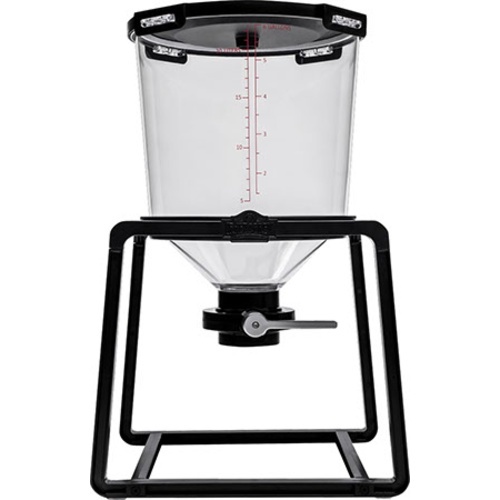 Having the trub trap on an affordable conical fermenter is fantastic. Easy to disassemble and clean. Having the clear plastic to monitor fermentation is neat, too. Transportation between where I brew to where it is fermenting is a slight issue and I assume would be for most people. Because of the positioning of the majority of liquid above the frame this makes the center of gravity higher than the frame, which is the natural carrying location. Awkward for anyone to move. Great concemp although my recipes are for a larger volume. 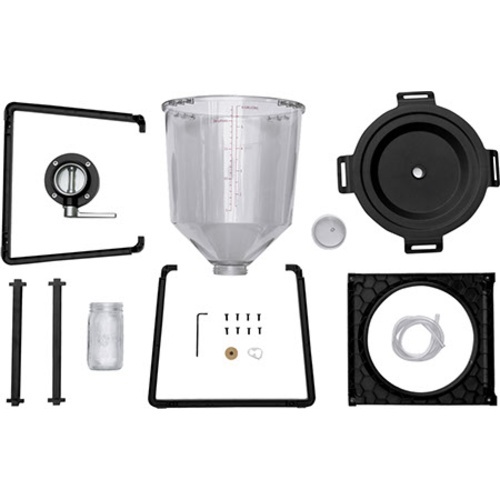 I purchased this after using brewing buckets and find the volume too small for my recipes; I start with 7 gallons of water; I will need to adjust them down 1 gallon and should work fine. The seal is very good even when the bubbler gets plugged with foam. My current batch of Porter is setting at the 5 gallon mark and I need to clean the bubbler at least twice a day due to foaming and have dumped two pint jars using the trap with this recipe. I will continue to use for smaller test batches; 6 gallons of water at flame on and quart jar on the trap. If this product was increased to 8 gallons and had a domed lid I would definitely purchase the new model because I like all the features just not the current size. How do I like it? It was love at first batch. If it was a woman I would marry it.......'nuf said. This is an excellent product that makes removing trub and reusing yeast a breeze. 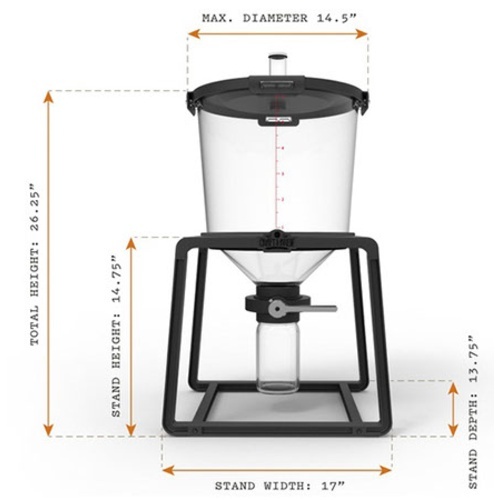 This is a well made product and I own two of these and have used each of them for about 5 brews a piece and have very few complaints. The gasket on the lid can be tricky to get on, it is easy once you slowly work it. This gasket has a tendency to fall of if you pull the lid of to quick, because of the great seal it creates a sucking that can pull the gasket off the lid. I have made 2 modifications to mine so it would have a sample port and thermowell. As promised, the Catalyst from start to end, is easy to set-up....primary, conditioning/dry hopping and bottling - like a champ.